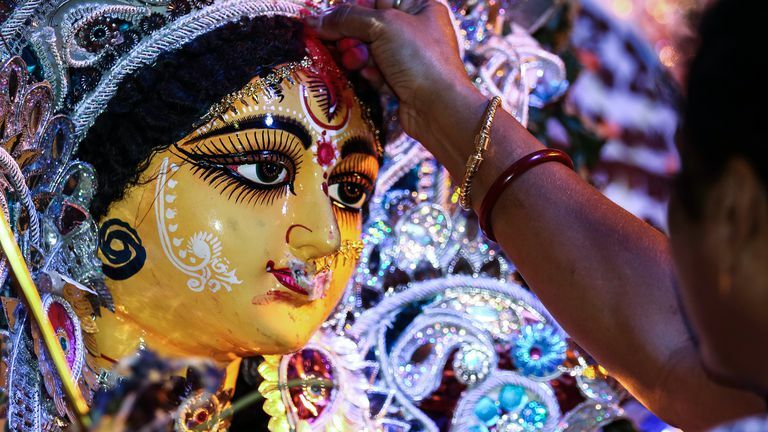 During Navaratri, we invoke the energy aspect of God in the form of the universal mother, commonly referred to as "Durga," which literally means the remover of miseries of life. She is also referred to as "Devi" (goddess) or "Shakti" (energy or power). It is this energy, which helps God to proceed with the work of creation, preservation, and destruction. In other words, you can say that God is motionless, absolutely changeless, and the Divine Mother Durga does everything. Truly speaking, our worship of Shakti re-confirms the scientific theory that energy is imperishable. It cannot be created or destroyed. It is always there. We think this energy is only a form of the Divine Mother, who is the mother of all, and all of us are her children. "Why mother; why not father? ", you may ask. Let me just say that we believe that God's glory, his cosmic energy, his greatness, and supremacy can best be depicted as the motherhood aspect of God. Just as a child finds all these qualities in his or her mother, similarly, all of us look to God as a mother. In fact, Hinduism is the only religion in the world, which gives so much importance to the mother aspect of God because we believe that mother is the creative aspect of the absolute. 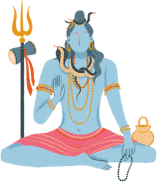 Due to the changes in nature, the bodies and minds of people undergo a considerable change, and hence, we worship the divine power to bestow upon all of us enough potent powers to maintain our physical and mental balance. Navaratri is divided into sets of three days to adore different aspects of the supreme goddess. On the first three days, the Mother is invoked as a powerful force called Durga in order to destroy all our impurities, vices and defects. The next three days, the Mother is adored as a giver of spiritual wealth, Lakshmi, who is considered to have the power of bestowing on her devotees the inexhaustible wealth. The final set of three days is spent in worshipping the mother as the goddess of wisdom, Saraswati. In order to have all-round success in life, we need the blessings of all three aspects of the divine mother; hence, the worship for nine nights. Why Do You Need the Power? In worshipping "Ma Durga" during the Navaratri, she will bestow wealth, auspiciousness, prosperity, knowledge, and other potent powers to cross every hurdle of life. Remember, everyone in this world worships power, (aka Durga), because there is no one who does not love and longs for power in some form or the other.